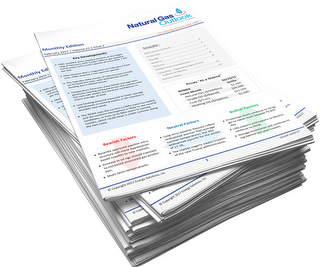 Natural Gas Outlook is a suite of publications and website reports that cohesively work together to help businesses make informed natural gas buying decisions. The reality is that gaining access to information in today's world is easy, but developing an action plan can still be frustrating and time consuming. Many suppliers and publications offer wide-ranging bits and pieces of information on production, demand, weather, storage, rig counts, and more, but it is up to the reader to piece the data together to form a conclusion of what it means to natural gas prices. 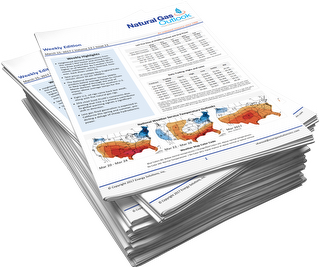 Natural Gas Outlook goes that extra step by providing comprehensive summaries of price-moving market criteria AND identifies the impacts on current and future prices. This saves you time, while also making sure important opportunities are not missed. That's what sets us apart! Broad perspective of the U.S. natural gas industry. 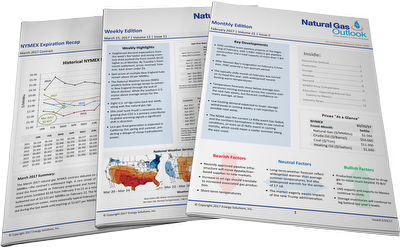 Expert commentary on price-influencing factors, including longer-term weather, gas and crude oil supply/demand, shale production changes, storage, rig counts, seasonal pricing trends, technical indicators, and more. Engaging industry articles covering pipeline expansions, LNG exports, regulatory changes, power generation, and more. Weekly recap of short-term and longer-term natural gas price action. Daily NYMEX price data, and weekly updates for shorter-term weather, rig count, storage, the Commitment of Traders Report. Delivered one business day following each NYMEX contract expiration. Summarizes trading activity in its last month and last five days of trading. Provides a comparison against the background of historical prices. Graph illustrating historical expiration price trends. Daily NYMEX pricing and market commentary. Weekly rig count and production forecasts. Monthly EIA Short-Term Energy Outlook and price forecasts.